1. Fire pit. What guy doesn’t like the outdoors? Now tell me, what guy doesn’t like to burn things outdoors? There. Done. This one is from Lowes. 2. Leather excursion case. If your man travels quite a bit for work or just likes to travel in style. This one is monogramed by Red Envelope. 3. Space pen. I got this for Nathan a few years ago. What a boring gift. A pen. But a bullet space pen. It’s he favorite thing. He takes it with him everywhere. It’s short when closed, regular pen length when fully sized. It writes upside down, in the freezing cold, in boiling heat and under water. 4. SunnyBags. For the eco-friendly tech guy. These bags have solar panels that charges your gadgets while he is out and about. These SunnyBags are made in Austria. You can other solar bags on Amazon. 5. Cloud 9 Living. If you rather create a memory and give him the experience of his lifetime then Cloud 9 Living is your answer. You purchase an experience or a gift card that is good for an experience of his choice. Experiences are relative to where you live, but some examples are hot air balloon rides, race car ride along, couples massage, private golf lesson by a PGA pro, adventure film making and I could go on. This gift will win you the wife of the year award. Love that space pen, I’ve gifted it to my dad before! Saia would love that firepit… Maybe one day when we can afford it. 🙂 And I’ll have to keep that cloud 9 living idea in mind for a future event too. Oh! 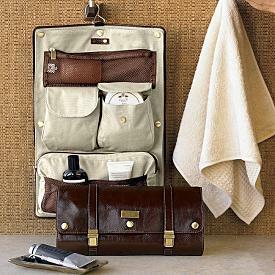 I gave my husband that exact leather toiletries bag from Red Envelope a few years ago, and he LOVES it. He doesn’t travel for work but when we start packing for a trip together he gets really excited to pull it out and load it up. Red Envelope has all sorts of great, unique gifts for guys.